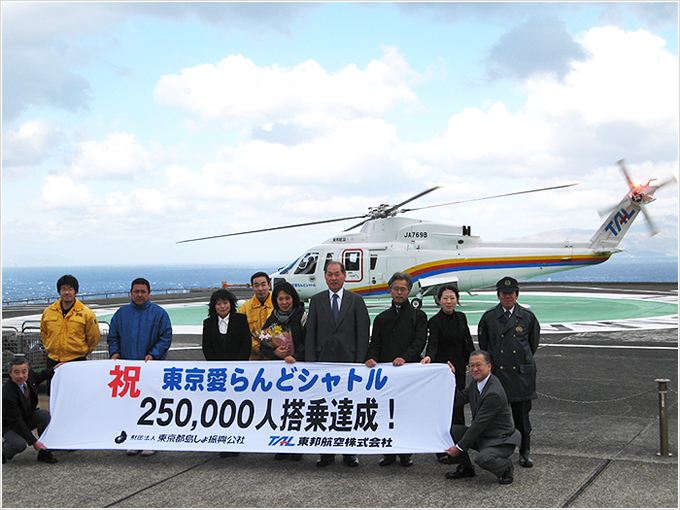 250000 Passengers Enjoyed Flying with Us ‹ CSR : TOHO AIR SERVICE Co., Ltd.
Today, Tokyo Ai-land shuttle has reached the 250000 passengers record, and on this special occasion, we would like to express our sincere appreciation for our guests coming here all the way from Tokyo and other places. In August 1993, given a support from the Tokyo Metropolitan Government, Tokyo Ai-land Shuttle has been launched as a commuter service that links together the six islands, based on HachijMjima island, down to the southern Aogashima island, up to the northern Mikurajima, Miyakejima, Toshima and Lshima islands , serving as a part of rapid transportation for the islands, without a single accident to this day. At first Tokyo Ai-land shuttle service was launched with limited number of flights, closed on Sunday, operating only 3 days a week during the rainy season. However, responding to the increasing demands from our customers, we have been operating daily since September 1996. For this reason, it took 3 years and 10 months to hit the first 50000 passengers record, but as the number of passengers increasing, shorter it took to hit the next 50000 , and recently hit the 50000 only within 3 months. Tokyo Ai-land shuttle is not only being the sole commuter service operated by helicopter in Japan, but also making a remarkable performance record in the world. We would like to express our sincere gratitude for our guests coming here today and all of whom have rendered their support and advice to us, with which we have been able to provide a steady service and to be satisfied by our customers. We will continue to maintain a safety operation, taking this special occasion as another step, and together will strive harder to be satisfied by the local islanders. We would like to ask our customers for their continuous support and advice, and again express our gratitude for all those who have been supportive to us. Toho Air Service Co., Ltd. Copyright (C) TOHO AIR SERVICE Co., Ltd. All Rights Reserved.